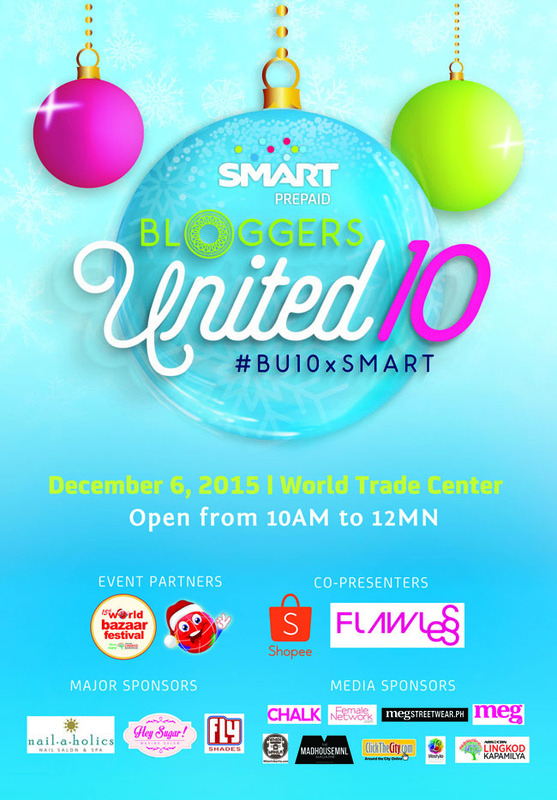 Among the attendees of this year’s Bloggers United are top bloggers as well as style and fashion personalities such as Sarah Tirona (me, haha! ), Vern & Verniece Enciso, Jasmine Curtis-Smith, David Guison, Laureen Uy, Camille Co, Kryz Uy, Lissa Kahayon, Dani Barretto, Patricia Prieto, Mikyle Quizon and Divine Lee - promising a one-of-a-kind shopping experience presented by SMART Prepaid. In keeping with the spirit of the yuletide season, the event is likewise a part of a wider effort to promote charity as part of the proceeds of WBF 2015 will be for the benefit of the ABS CBN Lingkod Kapamilya Foundation. I'M GIVING AWAY 10 PAIRS OF TICKETS SO YOU CAN SHOP OUR CLOSETS WITH YOUR BFF! Make sure to leave a comment below with your name and twitter handle so I can contact you if you win. Good Luck and see you at #BU10!!! I hope to see you and have pictures taken this BU10! I cant wait!!! See you omg!!! Omg Ms.Sarah! This brought hope for me to see you guys. So happy.